If you’re making a dashboard-style report in Excel, you may prefer that a chart not be cluttered with all of the available data, but instead allow the report consumer select which set of data to analyze. 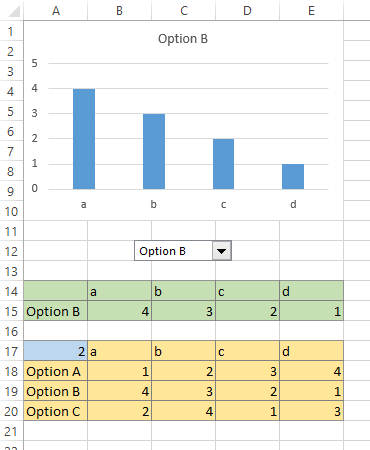 This example will let the viewer select from among the three options in this table. 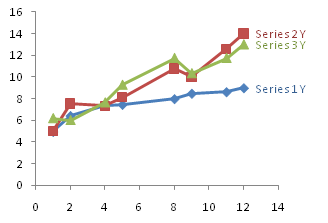 Start by moving the original data range (shaded orange) down several rows, out of the way of the chart. This data can actually be located far away, even on another sheet. 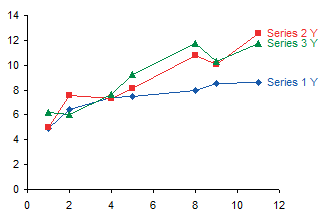 Insert a “staging area” (shaded green below) and insert some temporary dummy data. This area can also be located anywhere else. Create a chart using this staging area as its data source, and position it where desired. You need to make the Developer tab visible in the ribbon, if it isn’t already. In Excel 2010 and 2013, click the File tab, click Options, click on Customize Ribbon, and in the right-hand list, check the box in front of Developer, and click OK.
On the Developer tab, click Insert, then in the Form Control section of the dropdown, click on the Combo Box button (second from left in first row). The cursor turns into drawing crosshairs. Draw the Combo Box, then position it where you need it. 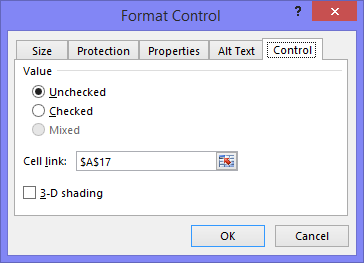 Right click on the Combo Box control, and choose Format Control. 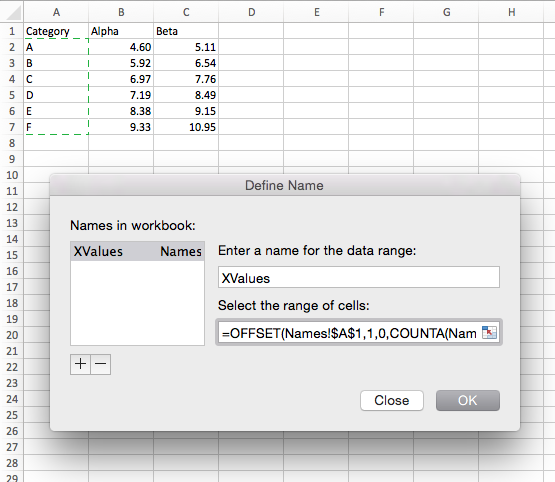 Click in the Input Range box, then select the range of cells that contains the items to show in the list (A18:A20). Click in the Cell Link box, and select the cell where the index of the selected list item will be displayed (A17). Click OK. Note that the Combo Box control’s link cell is shaded blue in the screenshot below. The interactive chart is now live. When you select another item in the Combo Box, the data in the staging area updates, and the chart displays the new data. You could just as easily use this interactive technique with a line chart, or pretty much any chart type. You also can locate the Combo Box control wherever you want. In the example below, it has been placed over the chart, taking the place of the chart title. You are not constrained to using Combo Box controls. You could insert a List Box control (fifth button in the first row of the Insert Form Control dropdown on the Developer ribbon tab). 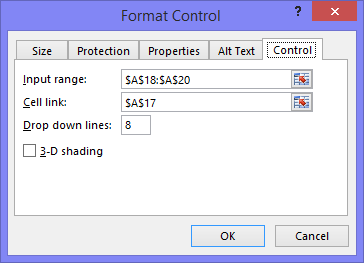 The format dialog for the List Box control is essentially the same as for the combo box, with an Input Range for the cells containing the items in the list, and a Cell Link for the cell displaying the selected option. You could also use a series of Option Buttons (last button in the top row of the Insert Form Control dropdown on the Developer ribbon tab). 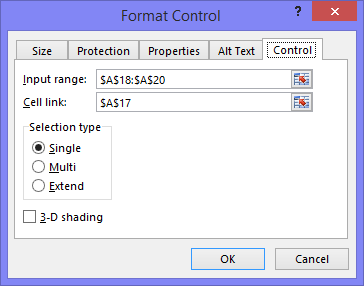 The format dialog for the Option Buttons only has a Cell Link box for the cell that indicates which option button is selected. You only need to format one Option Button in the set, though there is no Input Range, so the caption of each Option Button must be typed individually. There are pros and cons of each of the control types used in this example. The List Box shows all items in the list, but requires a space tall enough to display them all. The Option Buttons show all items, and requires enough space for all Option Buttons needed. But these controls may be arranged in a column, or in a row, or in whatever arrangement you want. We already know that changing the control changes the Cell Link value, and therefore the staging area data and chart update. But typing a number manually into the Cell Link changes the staging area and chart, and also changes the control. And if for some reason you have multiple controls that use the same Cell Link, changing any one control changes all of the controls as well as the staging data and chart. 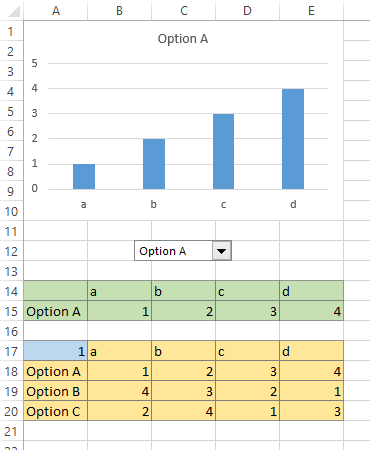 This can be useful if you have several sheets of interactive charts, and you want all of the charts to show the same option. Set up only one Cell Link, on only one sheet, and use this Cell Link for all controls, and use its address in the formulas of all staging areas. Posted: Tuesday, January 21st, 2014 under Dynamic Charts. I’ve written many blog posts and web pages on Dynamic Charts. 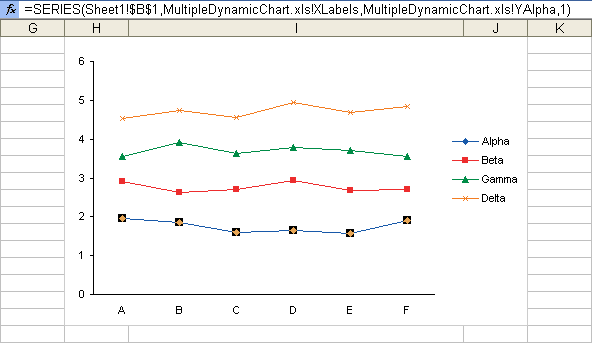 See Dynamic Chart Review for a summary and Archive of ‘Dynamic Charts’ for an archive of the Dynamic Charts category on this blog. 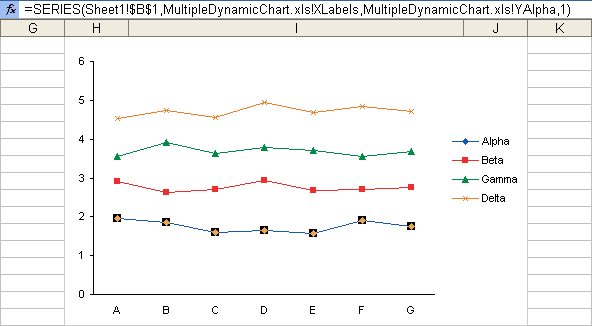 What they have in common is that they rely on you to define dynamic ranges in the worksheet, and then assign these dynamic ranges to the chart source data. Not too bad if you’re doing one or two series or a couple of charts, but after a while the tedium can turn your brain into mush. What do 99%* of the dynamic charts ever created have in common? They are used for sets of data that stretch with time as more rows are added. In the examples cited above, there are other categories of dynamic charts, but those are much less common. * Don’t tell anyone, but this is one of the 96% of statistics that are made up on the spot. 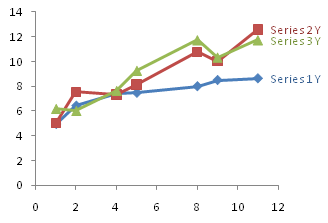 In the classes I teach I always start with an easier way to make dynamic charts for expanding or shrinking data sets. To answer a question the other day, I looked up the link to my blog post on this topic, and I couldn’t find it. So I had to write something, and here it is. 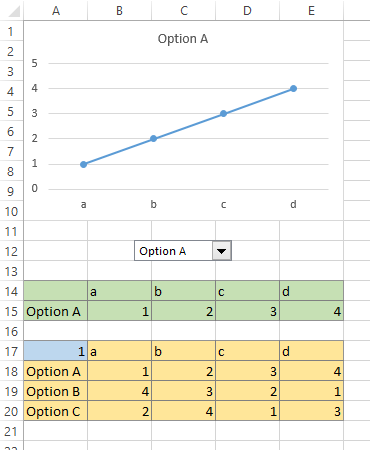 If you are using Excel 2003 or later, it is remarkably easy to create a chart that depends on a data set with a varying number of rows. 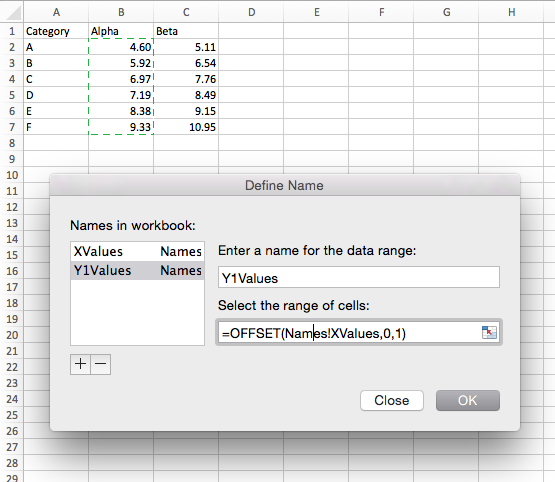 The technique makes use of a feature introduced in Excel 2003 called the List, which was enhanced and embellished in Excel 2007, and renamed the Table. When Excel 2003 came out, the new List was the awesome killer feature that made me immediately upgrade to 2003. Unfortunately, neither Excel 2007 nor 2010 has such a feature, for me anyway. A List or Table is a designated range that has a row of column headers and rows of data beneath this. The List or Table has the functionality of an Autofilter built in, without the Autofilter’s limitation of allowing only one per worksheet. As data is typed in the row below or in the column beside the List or Table, the List or Table expands to include this newly added data. As rows or columns are inserted or deleted, the List or Table accommodates the changes. The most important feature of a List or Table is that any formula that references a full column of data in the List or Table updates its cell addresses when the List or Table changes its number of rows. In addition, a pivot table that uses all rows of a List or Table updates its source data range to the resized List or Table. The chart SERIES formula updates as the List/Table changes size, making Lists/Tables ideal for many dynamic charting purposes, and here I’ll show you how that works. Let’s start out with this typical made-up data set. It has columns of data, X and Y values in this case, and a row of headers. To create a list in Excel 2003, press Ctrl+L (L for List). 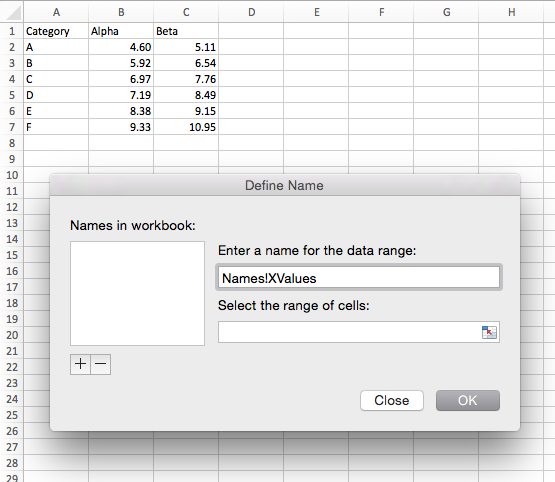 Excel guesses what range you want to use and whether that range includes headers. The guess is almost always what you expect. To create a list in Excel 2007, press Ctrl+L. They didn’t mess up any Excel 2003 users by changing the shortcut. The dialog is the same, except it now calls the List a Table. 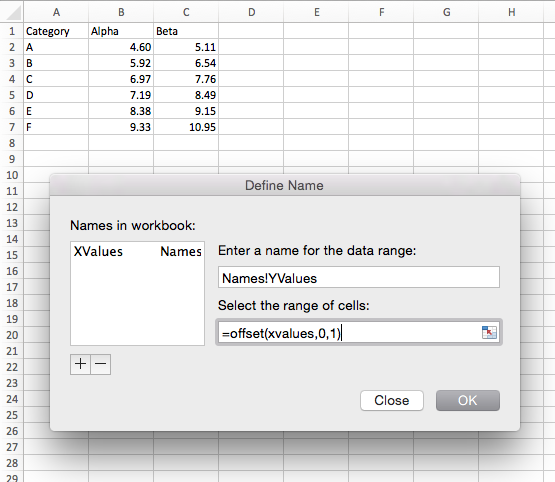 Here’s what the newly created List looks like in Excel 2003. When the active cell is not within the List, there is a thin blue border highlighting the List. 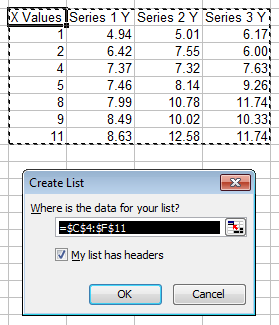 If your range did not include headers, Excel inserts a row and uses dummy headers as shown below. 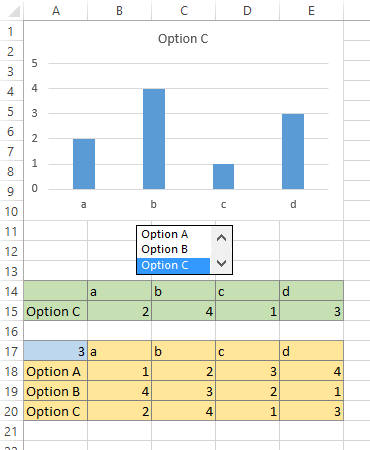 If one of your columns did not have a header, Excel inserts a dummy header. If you want a header to appear blank, you need to type a space character in the cell. When the active cell is within the List, the thin blue border becomes a thick blue border, Autofilter dropdown arrows appear in the header row, and the list expands by one row, giving you a data entry row denoted with a blue star in the leftmost cell. 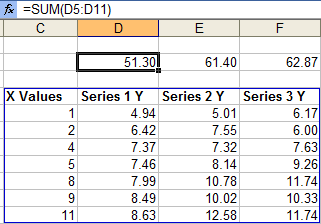 Any formatting and formulas are filled down as you enter data into this row. When you enter data in this row, the next row becomes the new record row. As you add rows to the List, any data below the List that would be overwritten is itself shifted down by one row. The bottom right corner of the List has a small gray backwards “L” shape, which you can drag the change the dimensions of the List. You can click and drag on the thick border to move the List around the worksheet. 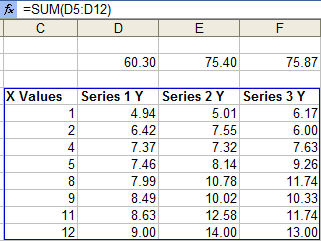 Here is the same data, converted into a new Table in Excel 2007. There is no border highlighting the Table, but the Table takes on the default Table formatting. 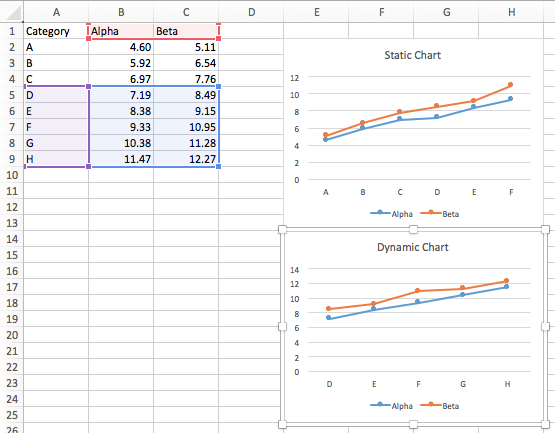 A bit much, but that’s what Excel 2007 is all about. The bottom right corner of the Table is indicated with a small blue backwards “L” shape, which you can drag to change the dimensions of the Table. You can click and drag on the (unseen) border of the Table to move it around the worksheet. When the active cell is within the Table, it does not change its appearance. The Autofilter dropdown arrows are always visible. 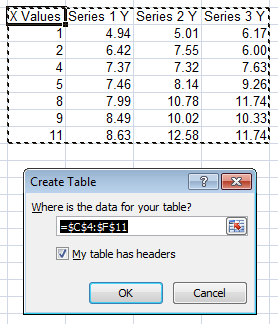 Also, the empty row below the Table does not explicitly become a data entry row, as indicated by the unformatted row below the Table shown here. 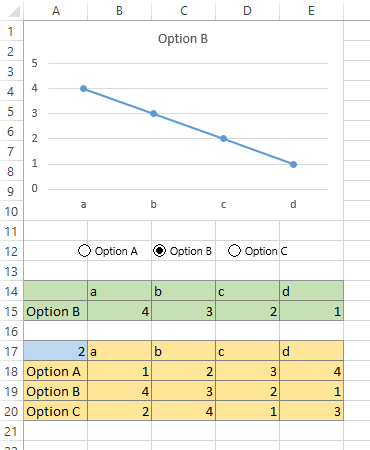 If you type data in the unformatted row below the Table, Excel assumes you want it added to the Table, and the Table and all of its formatting is filled down to include the new data. 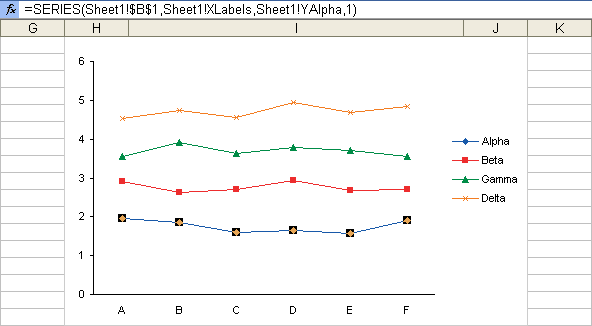 Here is an Excel 2003 XY chart that uses the data in our Excel 2003 List. It is created like any Excel 2003 chart: select the data and run the Chart Wizard. 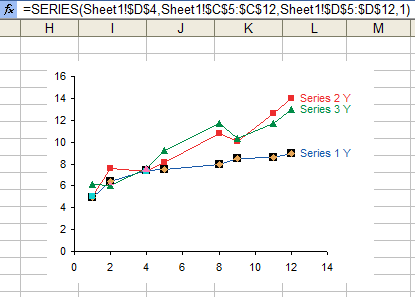 Here is an Excel 2007 XY chart that uses data from our Excel 2007 Table. It is created by selecting the data and choosing the chart type from the Insert tab. 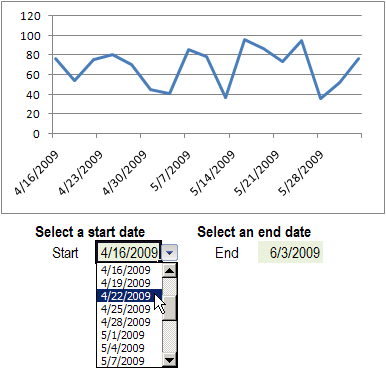 When the Excel 2003 chart is selected, you can see the chart source data highlighted in the List. Green (top row) denotes series names, purple (left column) X values, and blue (the bulk of the List) Y values. 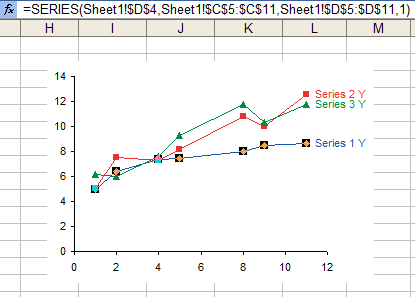 When the Excel 2007 chart is selected, the Table is highlighted the same way, but the highlighting is a bit difficult to make out with all that shading in the default Table style. No problem, I created my own lightly formatted Table style, and applied it to my Table. Now the highlighting shows up clearly. To illustrate this wonderful behavior of Lists and Tables, I placed formulas in a row above the Excel 2003 List that calculate the sum each column of Y values in the List. This works identically in Excel 2007. The formula includes all data rows in the List, from 5 to 11. I expanded the list by entering a new row of data. Without any further effort on my part, the formula updates to extend to row 12, the new bottom of the list. Here is my Excel 2003 chart from above, after the List was expanded. 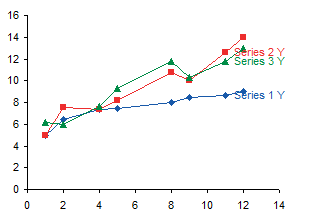 Each series extends one point further, plotting the data in the new row. 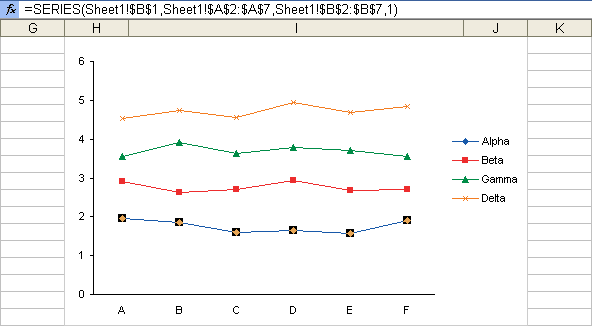 Here is the corresponding Excel 2007 chart, which now includes data from the new row in the Table. The data labels in these charts are attached the the previous last point in the series, so the new point and line segment partially obscure the labels. No problem, simply rerun my Label Last Point routine to move the labels. 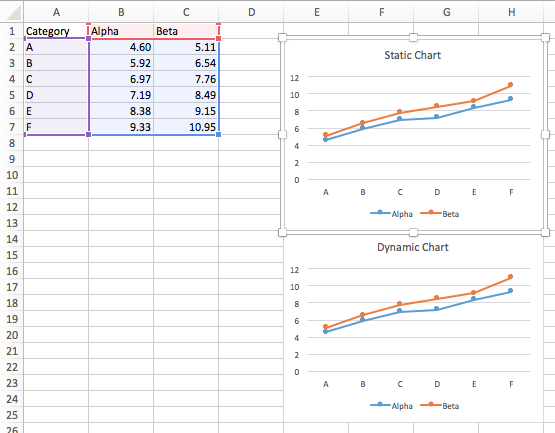 Here’s the fixed up Excel 2003 chart. 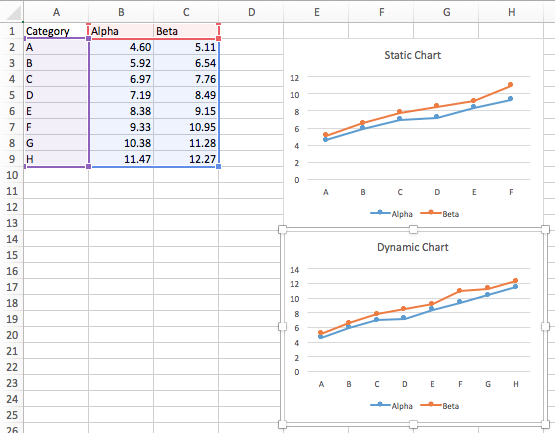 And here’s the fixed up Excel 2007 chart. … and the entire Table in 2007. 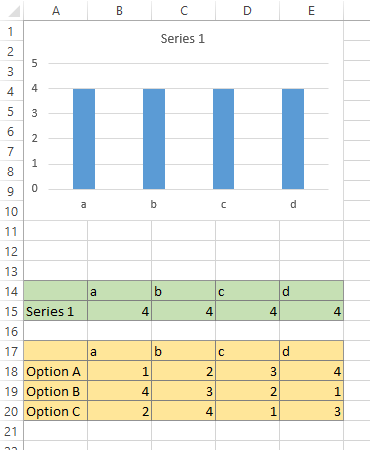 Here is the Excel 2003 chart of the original List, with Series 1 Y selected to show the chat SERIES formula. Note the X and Y values include rows 5 through 11. 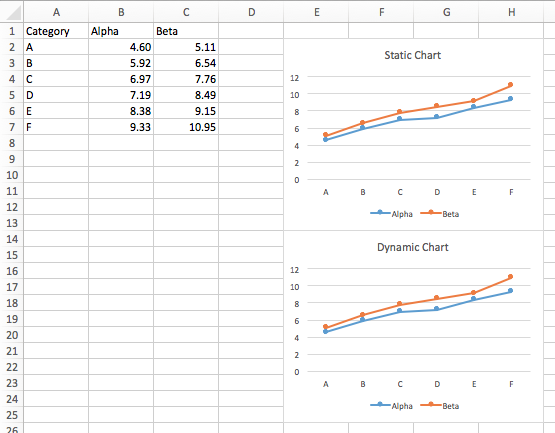 Here’s the same chart and the same chart SERIES formula after the List is expanded. The X and Y values now include rows 5 through 12. The Excel 2007 behavior is identical. 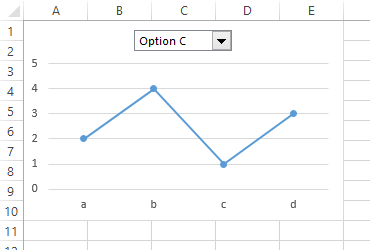 No discussion of dynamic charts in Excel is complete without a description of charts that use Lists or Tables as their source data. It is so much easier to use Lists or Tables than dynamic names to make charts respond dynamically to the number of rows in your data. I certainly claimed that I would post more, but there have been some circumstances beyond my control. I had to struggle to get even this one post completed this month. Here is a plot of January’s actual high and low temperatures (dark gray bars) compared to their typical values. To all you Celsius people, water freezes at the top of the light gray bars. Guess which morning we awoke to a malfunctioning furnace. I’ll give you a hint: see that blue diamond on January 24th, at -9°F? It got down to 47°F in the kitchen before the faulty intake compressor was replaced. Fortunately the upstairs furnace was fine. Here’s a plot of January’s snowfall, daily totals as blue bars, and cumulative total as a dark blue line. I didn’t provide a plot of wind, but we get a lot, which means 6 inches on this chart represents 6 inches that fell on the driveway plus 6 inches that blew onto the driveway from the lawn. Each bar represents one to three hours of shoveling and snowblowing, hours I could have been blogging. The exception to shoveling hours is the total of 21.1 inches on January 12th, which was four hours plus spent clearing the driveway by my wife and two daughters. The night before and the day of this storm I drove the 12 hour round trip to Rochester to deliver my other daughter back to school, because her flight the day before had been canceled. That’s two days I couldn’t spend blogging. Note: these charts were generated using the above technique, from an Excel 2003 List of data scraped from the accuweather.com web site. Posted: Monday, January 31st, 2011 under Dynamic Charts. 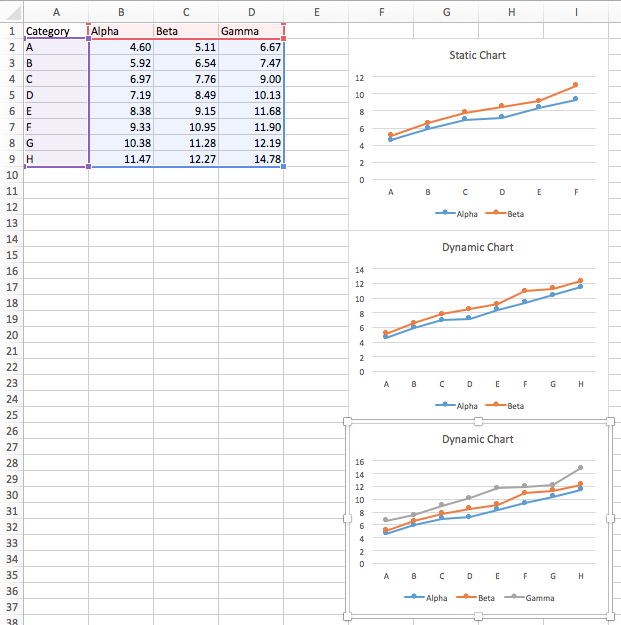 Tags: Dynamic Charts, Lists, Tables. On my web site and blog, I have over a dozen pages that talk about dynamic charts. A partial list of these articles is provided at the end of this post. 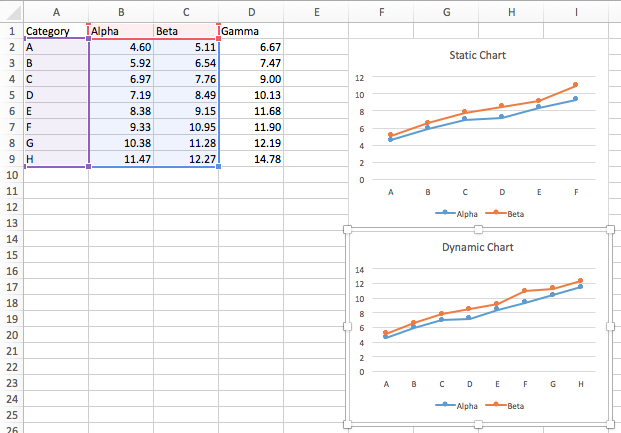 I was asked to expand on one of my examples, specifically to show a dynamic chart with multiple dynamic series. 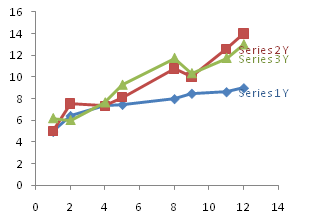 I created the following chart, and when the first series was selected, the SERIES formula showed the cell addresses of the ranges defining its data. 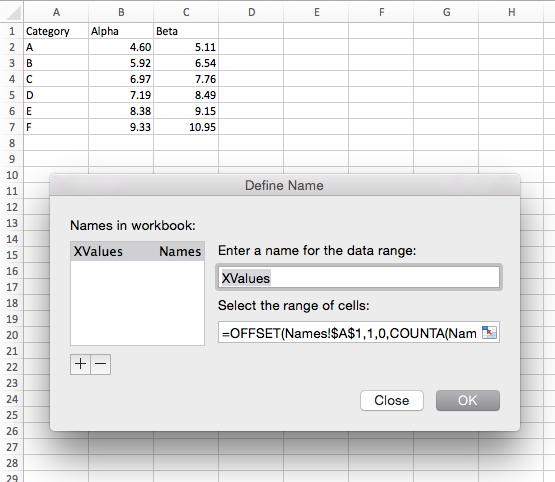 The OFFSET formula defining XLabels basically says, starting with cell A1, move down one cell and right zero cells, and give us the range which is as tall as the number of labels, given by the COUNTA function, and as wide as 1 cell. 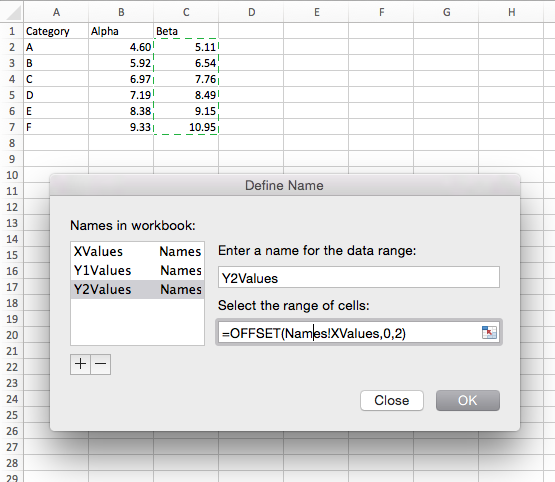 The other OFFSET formulas merely say, give us the range 1, 2, 3, or 4 columns to the right of XLabels. This is a shortcut that assures all dynamic ranges are the same size. To link the series to the dynamic ranges, all that is required is to replace the static cell references in the SERIES formulas with the names defined above. 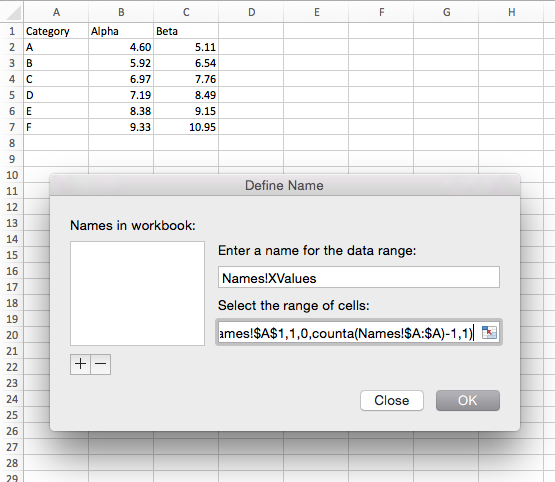 Here is the first SERIES formula when the cell addresses have been replaced by the names, before pressing Enter. Since the names were defined with the workbook as their scope, pressing Enter converted the references to workbook references, that is, referenced to MultipleDynamicChart.xls instead of Sheet1. 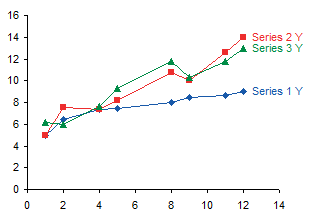 … the SERIES formula is not changed, but the ranges defined by the dynamic names does change, so the chart updates. The workbook with this example can be downloaded as a zip file, MultipleDynamicChart.zip. Here is a partial list of my articles on dynamic charts. Posted: Thursday, September 10th, 2009 under Dynamic Charts. My colleague and fellow MVP Debra Dalgleish shows a dynamic chart approach that lets you Select Excel Chart Dates From a Drop Down List. Debra has provided her usual comprehensive step-by-step instructions and an example workbook you can download. Her example was done in Excel 2007, but it works as well in previous versions. Debra contributed the first Dynamic Chart example on my fledgling web site, back when it was still just a hobby on GeoCities. Posted: Tuesday, May 5th, 2009 under Dynamic Charts.